On Thursday, May 31, students, tutors, parents, teachers, and supporters all came together at Intersection for the Arts to celebrate the release of Arrive, Breathe, and Be Still. The tenth Young Authors Book Project is the product of the hard work and dedication of the student playwrights of Downtown High School who worked all spring semester with 826 Valencia tutors and American Conservatory Theater to complete the project. The book is a collection of original plays and monologues addressing the themes of resilience and resistance. The students chose to dedicate Arrive, Breathe, and Be Still to teachers Eunice Nuval and Robert Ayala. Likewise, we here at 826 Valencia have been impressed by the level of dedication, care, and skill these teachers have shown during the time we’ve worked with them. During the opening remarks, 826 Valencia presented Ms. Nuval and Mr. Ayala with our Teacher of the Month award. They each received a shiny certificate, $1500, and hearty applause. As they arrived, students and tutors received their own copies of the book. Huge smiles, high fives, and shrieking abounded; the students were thrilled to see their words in print. The excitement in the room was palpable. To open the show, playwright Octavio Solis read from his foreword, exposing the parallels between his growth as a writer and the journey the Downtown authors undertook in telling their stories. He spoke of their immense courage and honesty both in creating and sharing their pieces, and he encouraged the students to continue writing. Then the students took the stage. Benjamin Andrade and Sarafina Sosoatau read from the introduction written by the student editorial board. They explained their early trepidation in undertaking such a big project and their process of “getting over it,” saying, “we couldn’t just sit there and do nothing, so we stood up and told our stories.” The crowd was then treated to performances by the students. Killari Xavier Meredith performed a monologue by Joseph Givens, and Naz Melancon performed Sarafina Sosoatu’s monologue. Finally, Joseph Givens and Tavana Faataui read from Selassie Johnson’s play. These students impressed everyone present, displaying their talent on page and stage alike. 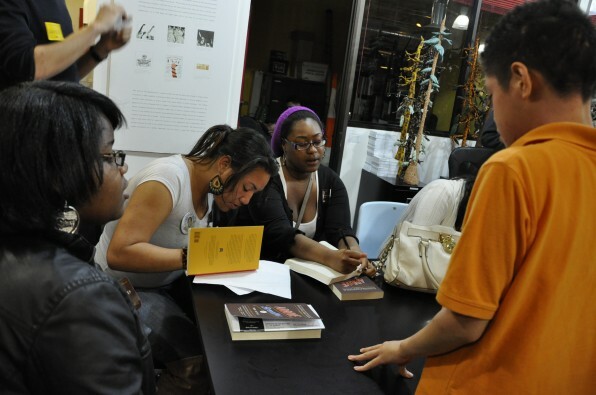 The party culminated in the formation of a long line of people bearing copies of the book for the students to sign. Most of the authors complained of hand cramps by the end of the night but hey, that’s the price of art. Arrive, Breathe, and Be Still is now available online and in the Pirate Supply Store. Congratulations to the playwrights of Downtown High School! This entry was posted in 826 News and tagged Book Release, Young Authors' Book Project.